The cooler temperatures are just around the corner, and that means a change of colors – leaves, trees and skies. There is a virtual plethora of ways to see the changing﻿ foliage. 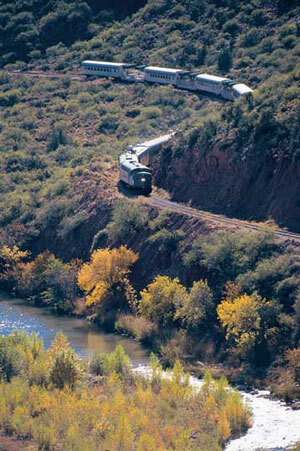 At El Portal Sedona Hotel may we suggest taking a ride on the Verde Canyon Railroad. You can enjoy the ride and scenery, while leaving the traffic, the backseat quarrelers and pit stops behind! Climb aboard Verde Canyon Railroad’s Fall Colors Tour. Then there’s nothing to do but relax and enjoy the changing of the season. Each vintage car is roomy and tasteful with comfy seating, and unobstructed panoramic windows. You’ll never have to move to experience an amazing journey; although this may prove irresistible. Between the excessive spread of appetizers served in first class and instant access to the open-air viewing cars, this trip has something for everyone! You experience a gentle ride through canyon walls painted in an array of brilliant autumn colors that shine and transform around each curve in the track. Watch for wildlife, you may see deer, Javelina, coyote and other animals and birds. Verde Canyon Railroad runs every day except Tuesdays. The depot is located in Clarkdale, 25 minutes from Sedona, making Verde Canyon Railroad the perfect Sedona day trip. At El Portal, we can help you book your Verde Canyon Railroad’s Fall Colors Tour, call us at 1-800-313-0017. We can make your Falling in Love with Fall fantastic! El Portal is luxury inn with twelve amenity filled guest suites, and is a pet friendly bed and breakfast with pet patios. We are located in the heart of Sedona, the perfect place to call your home away from home!